Tired, painful peepers are a common symptom of the digital age. Mostly, eye strain simply means your eyes need a rest. How common is eye strain? According to the organization Vision Council, nearly 67 percent of American adults report using two or more digital devices simultaneously, and 59 percent report experiencing symptoms of digital eye strain. 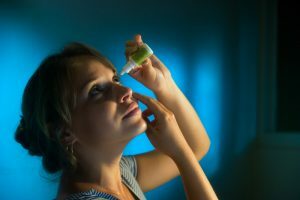 You won’t “ruin your eyesight” from reading in dim light—sorry, mom—but you may occasionally experience eye strain when you overtax your vision for prolonged periods. Fortunately, eye strain doesn’t lead to vision loss unless it’s associated with some underlying medical problem. In most cases, you can get to the bottom of the problem by process of elimination: Using the simple self-help steps below, you should be able to ease eye strain discomfort. First, let’s look at the basics. Eye strain is not a medical condition. Instead, it’s a symptom of the effects of certain habits, behaviors, and conditions. Medically, eye strain is called asthenopia—“weak eyes” in Greek. 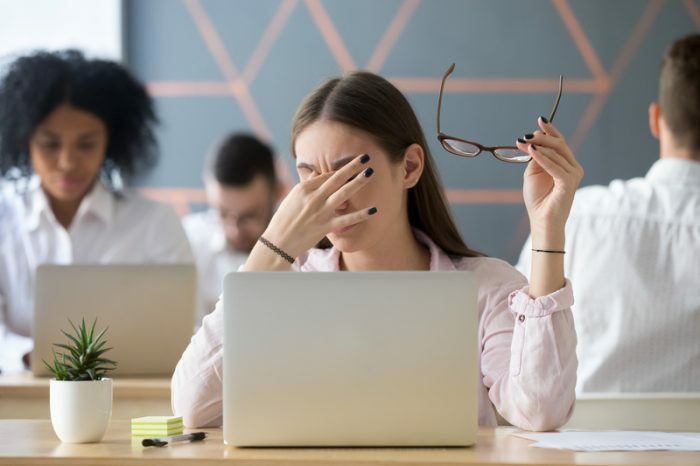 What many of us call eye strain also may include double vision, sensitivity to light, or tension in the forehead, temples, or back of the neck. People tend to use “eye strain” to describe a variety of problems that may be unrelated. Why do certain tasks tire the eyes out? To understand that, you need to know a little ocular anatomy. The natural lens of the eye is flexible so you can focus on things at far, middle, and close distances. Tiny muscles in a part of the eye called the ciliary body contract or relax to change the curvature of the lens. This allows you to focus on near or far objects. The muscles tighten to focus on nearby objects, which can overtax the muscles if you tense them for too long without a break. By the way, as you get older and the lenses of the eye get stiffer, the ciliary muscles are not able to fully adjust for near-vision tasks. Then you need glasses or contacts to read. Staring at screens for long periods subtly reduces the number of times you blink. This can cause dry eye as the watery protective layer on the eye surface evaporates quicker than it’s replenished. Environmental conditions, like dry heating or a fan blowing on you, can contribute to dry eye. Some diagnosable medical conditions cause eye strain. Among them are uncorrected refractive errors of vision, such as astigmatism, myopia (nearsightedness), hyperopia (farsightedness), and strabismus (cross-eyes). Chronic dry eye (dry eye syndrome) can also cause eye fatigue and irritation, which many people perceive as eye strain. In dry eye syndrome, the eyes don’t produce enough tears, or the tears don’t have the proper consistency to lubricate the eye. If you’re feeling the effects of eye strain, consider these DIY practices. Give your eyes a break: If you spend a lot of time doing one vision task, your eyes get fatigued. Try following the 20-20-20 rule: Every 20 minutes, look away about 20 feet in front of you for 20 seconds. This can help reduce eye strain. Keep your eyes refreshed: Try using artificial tears to prevent drying. If you can, become more mindful of how often you blink. Make sure you are not falling into a blinkless blank stare too often. Make your environment eye friendly: The American Academy of Ophthalmology recommends eye ergonomics to relieve strain on your vision. That includes adjusting your computer monitors and ambient lighting to reduce the strain on your eyesight. For example, reduce screen glare and boost the contrast a bit if your monitor has a setting for that. Check your prescription: If it’s been a while since your last visit to an optometrist, consider checking to see if your prescriptions for glasses or contacts are still accurate. What if the self-help steps above don’t relieve your eye strain? 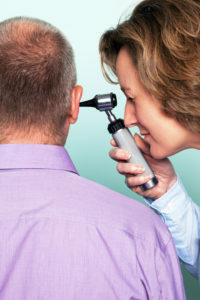 Talk to a doctor or an eye specialist about your symptoms. According to American Academy of Ophthalmology, signs you should see a doctor are eyes that are consistently red, blurry, or watery or that become sensitive to light or that feel painful. Technology is at the root of a lot of eye strain these days. The average American worker spends seven hours a day looking at digital display screens, at home and at work. This causes discomfort and vision problems that get worse with additional screen time. 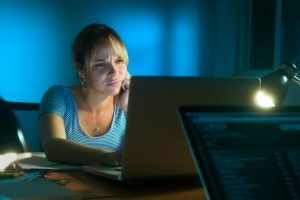 According to the American Optometric Association (AOA), computer vision syndrome (also called digital eye strain) includes vision problems related to prolonged use of computers (laptop and desktop), tablet computers, electronic book readers, and smartphones. There are many things you can do to reduce the impact of digital screen time on your vision comfort and performance. They include proper placement of your desktop computer monitor, reducing screen glare, sitting in an optimal position for viewing, having proper corrected vision from your eyeglasses or contacts, and using artificial tear drops to remedy dry eye. 4 strategies for natural dry eye treatment, astigmatism, ciliary body, computers, dry eye, dry eye syndrome, Dry eye treatment, dry eyes, eye institute, eye treatment, eyesight, fatigued, headaches, long periods, medical conditions, natural dry eye treatment, neck and shoulder pain, pain, posture, shoulder pain, tired, vision problems.